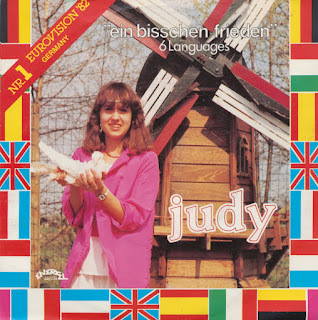 The sleeve of this single makes much of the fact that Dutch singer Judy sang her cover of Nicole's 1982 Eurovision winner 'Ein Bisschen Frieden' in 6 languages. She was obviously old enough to pronounce Dutch, German, French, English, Spanish and Italian convincingly, even if the lyrics were probably written down phonetically for her. As a cover version, this doesn't add much to the original song, it's just without the naive charm that would make Nicole win the Contest. This single comes across as a cynical ploy to cash in to someone else's success... but failing because it flopped of course. The less said about this single's B-side - in which Judy introduces herself in six languages - the better.